Well, I'm not starting September off very well! This post should have been up this morning. My daughter left for college early, so we were up and off to the airport at 3:30 AM. I intended to come home, nap, and then finish my post. I've been in such a brain fog from getting up at 3 (my nap was only about an hour! ), that this never crossed my mind as I've gone through my day... until now, so that's my long story about this later-than-it-should-be post! 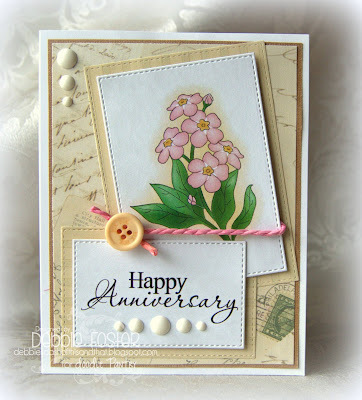 This is sweet, Debbie, I really love the elements in the background as well as your pretty floral pattern! Thanks for sharing this with us at the Simon Says Stamp Wednesday challenge! Very pretty Debbie. I need 2 anniversary cards this month. I justmay have to case this one. Gorgeous! Have a great weekend! Beautiful layering and gorgeous image. Thanks for sharing your card with us on Creative Moment challenge. LOVE your flower panel and colouring, LOVE your pretty layers too!! !